I’m not a big drinker. I occasionally like a drink, but I never feel like I need a drink. However, I have developed my own preferences for different kinds of alcoholic beverages. So, I started thinking about how three different drinks affect me. They all have alcohol in them, but I react differently to each one. This is the staple alcoholic drink of many countries, including my home country of Canada and my adopted country of Japan. When people go out drinking, most will drink beer. Beer in Japan is very similar to beer in Canada. I would describe it mainly as a lager type beer. With an average alcohol content of 5 to 5.5%, this beverage has the lowest level of alcohol of these three. I like beer, but I find that the last bit in the glass is so bitter that it makes me shudder a bit. I don’t do well with strong bitterness. But the more I drink, the easier it gets. It takes a lot of beer to really affect me. A glass does very little. I start to feel it after 2 glasses, but after 4 or 5, I have trouble walking completely straight. The alcohol in beer sneaks up on me. It slowly affects me, and it slowly goes away. It leaves me with an unpleasant aftertaste. But I still like beer. I’m not a big wine drinker. In fact, I can count the number of times I’ve had wine on one hand. My first experience with wine wasn’t very positive. I just didn’t like the taste. I had wine tonight. It was decent. It was like dry, alcoholic grape juice. It wasn’t so fruity, but it was quite dry. What I drank was a red Cabernet Sauvignon from Argentina with a 13.5% alcohol content. I only drank 2 glasses, and when I was finished, I still didn’t feel the alcohol. So, how does wine’s alcohol affect me? It takes a while for it to show itself. About 50 minutes after starting to drink it, I could finally feel it a bit. Since I had only 2 glasses, it wasn’t really much. I felt a little lightheaded, and the feeling kept growing for about half an hour. It seems like wine’s alcohol has a delayed reaction for me. Within an hour, I felt nothing from the alcohol. Japanese rice wine, or sake/nihonshu, is my biggest alcoholic love. I absolutely love this stuff! Hakkaizan from Niigata prefecture is my favourite at the moment. With an alcohol content of 15%, this has the highest level of alcohol of the three drinks. It also tastes the best, in my opinion. While beer’s bitterness makes it a bit unpleasant for me, and tonight’s experience with wine was similar, sake goes down so smooth. It is very easy to drink, yet it is the strongest. Even if I drink it slowly, the alcohol goes to my head very quickly. Even the dry sake is easy to drink. I don’t feel that it’s bitter, which is a bonus. The alcohol affects me quickly, but I recover very quickly, and I don’t feel the alcohol within a couple of hours. Although it has a higher alcohol content than beer, its effect is much shorter for me. And I don’t have any kind of bad aftertaste. It seems that sake is the perfect alcoholic drink for me. While beer is the cheapest, and I drink it the most, it isn’t my favourite. I think my level of satisfaction with the flavour is on par with wine. Sake wins in all aspects other than price. It is the best tasting, the easiest to recover from, and the most satisfying experience. Of course, alcohol affects different people differently. I’ve noticed that many Japanese people can’t handle alcohol very well, and this has a good explanation. Most Asian people have an enzyme that prevents the efficient metabolisation of alcohol in their bodies, so it makes them drunk faster. I have 3 or 4 drinks with little effect on me, while many Japanese people turn red-faced with only one drink. This is known as Asian flush reaction. It’s amazing how most people in Japan can’t handle alcohol well, yet it’s very common to go drinking with colleagues and bosses every week. But some people have such low alcohol tolerance that they can’t drink alcohol at all. It makes them feel sick with just a little bit to drink. As I said before, I don’t have much experience with wine, but I am interested in trying different kinds. What’s your favourite kind of alcohol? I’d like to present to you a writing exercise I will be doing regularly to hone my narrative abilities. I’m calling it “Dramatically Mundane.” What I’ll be doing is taking a regular, everyday action or activity and describe it in more detail than is necessary. Sitting down will become exciting. Washing hands will become sensual. Crossing the street will become amusing. I aim to make boring activities entertaining and interesting. I’ll be starting it this week, most likely. I haven’t forgotten about the other writing activity I’ve planned. I’m interested in getting that going, too. So, please stay tuned! I’d like to remind my readers about the review list I keep on this blog. I love lists, so my reviews are categorised in a few different ways. In addition to the full list by author, I have recently added a list of reviews by title. In the future, I’ll be adding a couple more lists. One is a list by date of publication, and the other is a list by the author’s country of origin. I may also list books by genre, though it’s sometimes difficult to categorise books by genre. As always, you can access the lists via the menu at the top of the page. Are there any other ways you’d like to see the books listed? Leave a comment! For a long time, I’ve wanted my own room dedicated to books and writing. Call it a writing studio, a library, an office, whatever you like to call it. Some guys have a man cave. I want my writing cave. Well, it’s not a cave, it’s a standard room, has a door and a window, as well as 4 walls, a carpeted floor, and a ceiling. I’m not much of a decorator, but I have my wishes for how I want it to look. And maybe my dream writing studio is pretty standard looking. I’d like two of the walls to be lined by big bookshelves. They should be nearly to the ceiling, with some space at the top for various things I may collect. I’d like them to be a rich reddish colour, maybe mahogany, cherry, or walnut. They will hold my library, all of the books that I own. I’ll arrange them by genre and author, allowing me to easily locate a book. The walls will be painted a darker colour. Bright colours are nice. I like bright colours, but I want my cave to have a warm feeling, and a rich, dark colour would be ideal. Like a red wine colour. That would warm me up. Furniture would be pretty standard. A desk for my computer, of course. I’d likely have a couple of laptops, a bigger desktop replacement, as well as a smaller netbook sized PC for writing away from home. While the above description sounds traditional, I want a modern desk with a sleek design. I wouldn’t just be using the computer for writing, but I do like other things, such as games, Youtube, Internet, and I can’t forget blogging. I have a love for maps, so one of my walls will have several maps. They’ll include a world map, a map of Canada, and a map of Japan. Additional maps may include those of the worlds I’m creating in my writing. I’d also like a nice, comfortable sofa to lounge on while I read. Not a leather or vinyl sofa, but a simple cloth sofa that I won’t stick to on a hot summer day or leap in the air from shock on a cold winter day. Some other various items may include astronomy related pictures or globes, plastic models of planes or ships (I’m interested in making these), and family photos. What’s your idea of your own personal dream room? 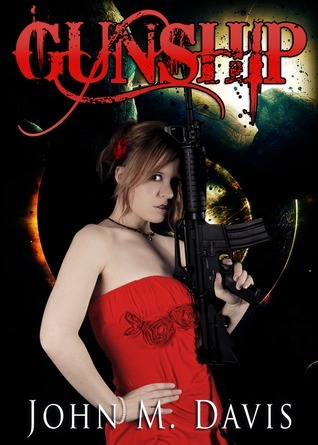 Gunship is the debut book by John M. Davis, and the first in a series of books. It’s available in Kindle format, though it appears there was a paperback edition. 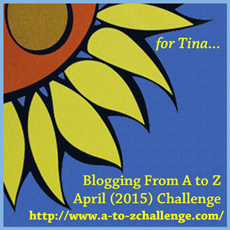 It was independently published, so this is the third indie book I’ve reviewed. I found this to be a very quick read. It’s not a long book, and is easy to finish quickly. It involves the crew of a gunship, a crew of outlaws wanted by many people, but they’re well-meaning. Captain Adam Michaels is the lead character, and he is a brash leader prone to impulsive decisions that aren’t always the best choice. Then there’s Dalton, his best friend and alcoholic, providing plenty of humour. Roman is a tough fighter with another side to his personality. Kelly, Kato, and Luck round out the crew, though those three have very little development. Sarah and Troy come in soon and complete the group. Of all the characters, I found Michaels and Roman to have the best development, while Dalton remained pretty static. Sarah seemed soft, but has a tough side to her. Kelly, Kato, Luck, and Troy don’t get much time to develop. The dynamic between Michaels and Dalton is humourous. The romance wasn’t very well done early on, unfortunately. I found it unnatural and a bit cheesy in the beginning. The story takes place both in space, as well as a handful of planets. There wasn’t much in the way of extensive description, it was kept pretty short, but was effective enough to create a solid picture in my mind. Although it’s in space, I found it interesting that most weapons were rather old-fashioned. I guess it’s retro sci-fi in a way. The antagonists were kind of like vampires, making it an odd combination with science fiction. The story itself is mainly action scene after action scene. There is a small amount of downtime in between, but not very much. It’s a very fast paced story, so there’s plenty of excitement. Davis describes the action reasonably well. It’s not a complex story, and is very straightforward. It’s not entirely predictable, but it doesn’t really give much in the way of surprises. But it is an entertaining story. I don’t base my reviews on editing issues, but I have to mention that this book really needs an editor to clean up the strange dialogue punctuation, spelling mistakes, and lack of line breaks between characters’ speech. It’s also difficult to tell when a scene change happens, as they’re not marked. Aside from the editing problems, I found this book to be fairly entertaining, though not very deep. It’s a simple story with pretty basic characters. But I did enjoy the story. I’d give it 3 stars. It’s an entertaining read, and I’m curious about where the story will go in the next book. Revelation Space, the first in Alastair Reynolds’ science fiction series Revelation Space held some big surprises for me. 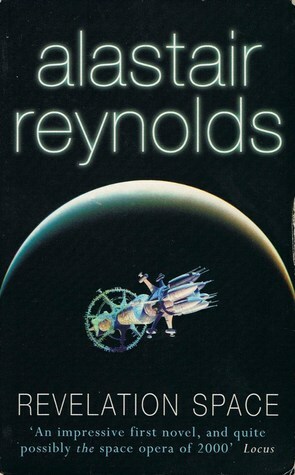 Reynolds was an astrophysicist who worked for the European Space Agency until he became a full time author. This book is a hard SF novel with plenty of interesting future technology. I went into this book not knowing what to expect. Although I read the blurb on the cover, it doesn’t really tell much of the story. This story takes place mostly on the planet Resurgam, but also in space and another planet, Yellowstone. The settings are quite dark and gritty. It seems much of the technology is very advanced, but there are problems. Everything is described quite well, although Reynolds uses a lot of very technical terminology. He was a scientist, after all. I found it difficult to get into this book in the beginning. For the first half, I didn’t really care about any of the characters. They all seemed so self-centred and not very likeable. However, many of the main characters began to grow on me, and I liked them by the end. Dan Sylveste is a very interesting character who is single-minded in his quest. Ana Khouri is probably my favourite character of the book. She’s a strong character, but still has many doubts. Ilia Volyova seems like such an unlikeable person, but I grew to really like her by the end. Pascale is a decent character, too. Sajaki is probably one of the more unusual characters, being a chimeric with a desire for power. Hegazi wasn’t developed very well, and I just couldn’t figure out what to make of him. But I particularly enjoyed Calvin Sylveste, who was a very colourful character. However, I could never be sure who was bad. It kept me guessing. As I said, I didn’t get into the book in the beginning, though around the halfway point, I was looking forward to opening the book and reading. It’s quite scientific, and some things were explained somewhat like a textbook. There was a lot of secrecy between the characters, and it made some of the story unpredictable, as I couldn’t tell what some of them were thinking. Towards the end, it was fantastic. I felt like I couldn’t put down the book. I certainly couldn’t predict the ending. I’m interested in what will happen next. I’ll give this 4 1/2 stars. The ending was amazing, but I found it hard to get into in the beginning. Some of the terminology may be difficult for some, but with my background in astronomy and physics, it wasn’t a problem for me. I found it fascinating. Highly recommended. There’s so much going on in my mind right now, I don’t know where to start. Over the past 3 or 4 weeks, I’ve been developing my stories quite a bit, mostly in my head. The first short story is becoming more fleshed out in terms of plot, but that’s not what’s been on my mind recently. I was debating whether to write a series of three short stories or combine them as a novel. Well, I will be writing a novel using those three stories. They all flow from one to the other, so it is a continuous storyline leading to a single conclusion. It’ll be written in three Acts, one leading into the other. Another thing occupying my mind right now is the planet’s name, as well as what to call the star and other planets in the system. The star will use its somewhat obscure Arabic name, while the planets will be related to the constellation’s mythology and history. Here’s a little teaser: the star is a G type main sequence star that is about 3 billion years old. It may seem too young for life, but there’s no reason to believe that life could develop faster on some worlds than on others. There could have been some catalyst that caused rapid evolution at a much earlier time than on Earth. So, if you can guess the name of the star, you win my admiration.